Eppendorf Mastercycler ep series thermal cyclers are a faster, reliable, and flexible solution to you PCR needs. The gradient function the the EP series thermal cyclers help you simplify protocol optimizations. 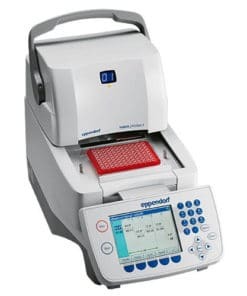 Eppendorf EP series PCR thermal cyclers can also easily be connected cycler to cycler ideal for modular laboratory environments. Eppendorf ep series thermal cyclers all feature electronic sample protection or ESP to ensure that sames are always heated efficiently and evenly. There is also an option for a motorized, on-touch automatic lid which may be a consideration if you plan to provide combine compatibility with robotic systems. A control panel with graphical user interface and color display (sold separately) also be used to control Mastercycler ep modules. The Eppendorf Mastercycler ep series thermal cycler range is made up of the Eppendorf Mastercycler ep gradient, the Mastercycler ep gradient S and the Mastercycler ep 384. The Eppendorf Mastercycler gradient model uses aluminum heating blocks and has a gradient range of 1-20°C. The Eppendorf Mastercycler ep gradient s has a wider gradient range of 1-24°C this improvement is achieved through the use of a silver heating block. Both the ep gradient and ep gradient s have temperature control rates of 4-99°C and support 96 well plates with 0.2ml tubes and strips. The Eppendorf Mastercycler also includes the Eppendorf Mastercycler ep 384 thermal cycler. This model shares many of the features of the Eppendorf Mastercycler ep gradient, but can hold up to 384 wells.